Bright stems for the winter garden. All the leaves have dropped from the trees. At this time of the year you would think that we had to rely on evergreen plants for any interest in the garden. This is not the case, it is also the time of year that interesting stems and barks come into their own. The most popular decorative stem has to be the dogwoods or cornus. These can vary from the deepest purple of Cornus alba ‘Kesselringii’, through the scarlet of Cornus alba ‘Siberica’ shown in this image to the bright yellow of Cornus sericea ‘Budds Yellow’. 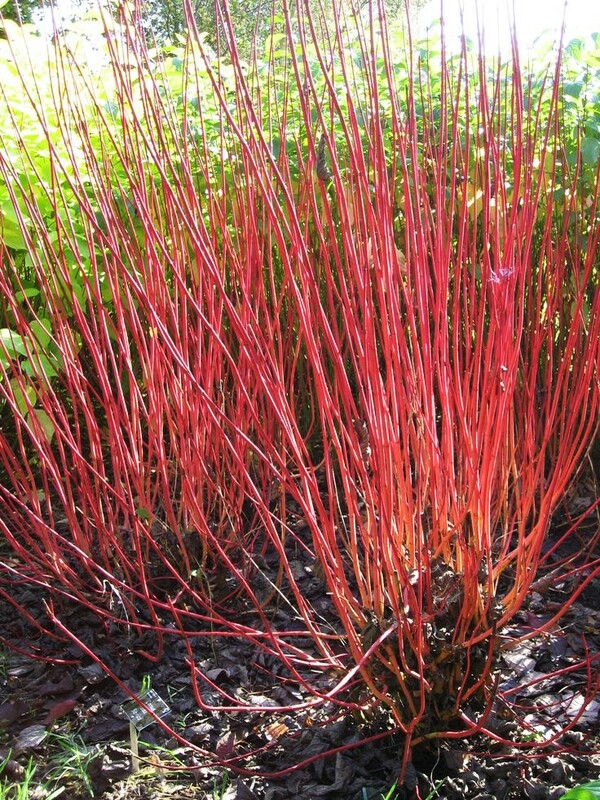 A dramatic and popular variant is Cornus sanguinea ‘Midwinter Fire’. Stems starting yellow at the base become redder towards the end. Another very similar looking plant is the willow (Salix) . As with the dogwoods they have striking colours during the winter. The image to the right below is Salix alba ‘Golden Ness’. Look out for Salix alba ‘Yelverton’ which is a very attractive deep orange variety. If you like to play with combinations, plant a Hamamellis x intermedia ‘Diane’ some distance in front of these to create a harmonious colour vista. Dogwoods grown for their winter stem colour such as Cornus alba, Cornus sericea and Cornus sanguinea are unfussy about their soil conditions and are able to thrive in damp soil conditions. Like all willows, the colourful varieties love very moist conditions. Prune hard in late winter to stimulate new growth for the next winter show.